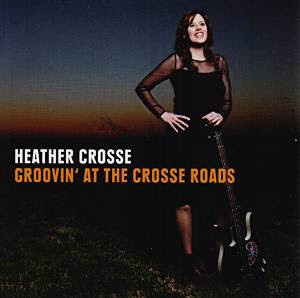 I just received the newest release, Grooving At The Crosse Roads, from Heather Crosse. This is an 11 track release of pure contemporary pop/light jazz music with a twist on R&B/Blues. Backed by Heavy Suga' & The SweetTones,this release has some real bright spots. Crosse plays bass as well as performs on lead vocal and does a real nice job. On opener My Man Called Me,Dan Smith hits a real nice guitar riff and Mark Yacovone sets a perfect stage on piano. On Why Does A Woman Need A Bass Guitar, Crosse really plays heavy bass with a few hot bass riffs in addition to what I'd call lead bass under the melody. Very nice! Clarksdale Shuffle is light and easy and Crosse's vocals are sweet as mama's home made pie. My favorite track, Hurryin' Up To Relax, has a cool R&B feel and warm backing vocals by Sandy Carroll. Nice shuffle track, Walking In Their Shoes finds Smith laysing out some really tasty guitar and slide solos and Yacovone's piano work is stellar. On blues ballad, Damn Your Eyes, Yacovone's piano and keyboard contributions are clearly super. Another R&B track, penned by Crosse, Steppin' Up Strong has a real Curtis Mayfield feel with warm backing vocals by Vicki Atkins and Yacovone's organ work really dresses the track nicely. Funky pop track, Bad Boy Kiss has a strong radio hook and Crosse's bass work, nicely grounds slick soloing from Smith and Vacovone. A tasty lead guitar line opens shuffle track, Call On Me and tight drums by Lee Williams, swinging guitar riffs from Smith, beefy organ by Vacovone and warm backing vocals by Atkins make this one of the top tracks on the release. Latin influenced, You Don't Move Me No More finds Crosse grinding out her vocals with a sassy attitude. I must say that watching a performance of Ms Crosse (disabled on youtube) was quite interesting. She really appears to be having a great time which is contagious. Her bass playing is aggressive and her smile is never ending. This is a artist to keep an eye on.